Goodreads said, "Sixteen-year-old Gemma has had an unconventional upbringing in India, until the day she foresees her mother's death in a black, swirling vision that turns out to be true. Sent back to England, she is enrolled at Spence, a girls' academy with a mysterious burned-out East Wing. There Gemma is snubbed by powerful Felicity, beautiful Pippa, and even her own dumpy roommate Ann, until she blackmails herself and Ann into the treacherous clique. Gemma is distressed to find that she has been followed from India by Kartik, a beautiful young man who warns her to fight off the visions. Nevertheless, they continue, and one night she is led by a child-spirit to find a diary that reveals the secrets of a mystical Order. The clique soon finds a way to accompany Gemma to the other-world realms of her visions "for a bit of fun" and to taste the power they will never have as Victorian wives, but they discover that the delights of the realms are overwhelmed by a menace they cannot control. Gemma is left with the knowledge that her role as the link between worlds leaves her with a mission to seek out the "others" and rebuild the Order." Gemma Doyle is an interesting and unconventional girl living in Victorian England. She grew up in India and over there she started to experience visions and unfortunately foresees her own mother's death. She is sent back to England to attend an all girls' boarding school and there she meets Felicity, Pippa, and Ann. She is having a hard time making friends and connecting with these girls, but due to a crazy turn of events, they start to go with Gemma to another magical realm, which Gemma can enter due to her visions. There in this other mystical world the girls can forget about Victorian England's rules and have a bit of fun, but there is something dark on the "other side" that the girls must be wary of. Plus, Gemma finds out about a mysterious group called the Order and its connection to her mother. 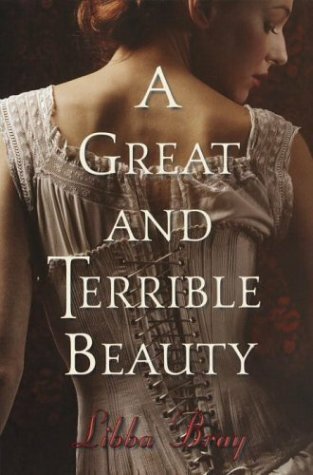 Libba Bray's A Great and Terrible Beauty is the first installment of an exciting young adult historical fiction series. Gemma is a fun character that is feisty and outgoing. I really enjoyed her and she is a strong foil for her roommate, Ann, who is quite the opposite. Even in Victorian England there are mean girls and Felicty is the queen bee and her beautiful best friend, Pippa, make the story that much more interesting as they are extremely cliquey and dramatic. Bray does a fantastic job portrying a historical fiction set in Victorian England, while still allowing contemporary readers to find some fun in the girls' antics. Also, there is a love interest in Kartik, a young man who followed Gemma from India and warns her about the dangers of her visions. I enjoyed the budding romance between these two characters. I love the setting of this book as you know I am a huge fan of Victorian England. I also liked that this book took place in a boarding school, Spence Academy. It's such a perfect location that really makes for an action-packed read, especially since the East Wing has mysteriously burned down many years before. Bray does a great job creating a memorable setting that has a ton of Gothic undertones. My only irritation with this novel was the fact that there was a lot of magic that wasn't always believable. I wanted to believe it, but sometimes it went a bit too far and it seemed absurd. There were many aspects of the magical realm that were just a bit too much for me. All in all, A Great and Terrible Beauty is a start to a promising series that will sweep fans away and back to a time where women were tremendously impacted by society's rules and expectations. If you are a fan of boarding school fantasies, you will really love this setting. I can't wait to see where Bray is going to take the story next in Rebel Angels and The Sweet Far Thing. This is actually my first YA series that got me hooked into reading. I hope you read the rest of the series. I'll be looking forward to seeing what you think. I liked reading this one too. I'm planning to read the two other books very soon, beause I want to know more about these characters. :) Great review! I read this ages ago. But like you I remember having a similar sentiment regarding the magic. It just seemed so far fetched. Great review! Great review! I've always wanted to read this series. I must get to it soon! I'm a huge fan of this series but I have a hard time getting my high school students to pick it up. Any ideas how to get them started in the series? i started reading this and got distracted after 10 or 15 pages...your 4 star review has inspired me to try it again! Thanks Christina!